He was the final player ever selected by the Hartford Whalers, but throughout his 751-game big-league career, Craig Adams has been a prominent contributor to team success. It was 1996, the draft year when Chris Phillips was taken first overall, and fellow NHLPA members Dainius Zubrus (15th), Daniel Briere (24th), Zdeno Chara (56th), Pavel Kubina (179th) and Tomas Kaberle (204th) also heard their names called. For Adams, who played a total of four collegiate campaigns with Harvard University, it will always be a unique bit of history in being taken 223rd overall by the team that would become the Carolina Hurricanes. But the forward, who was born in Brunei, raised in Calgary, has managed to also have his name attached to another piece of NHL history as well. “Whether you’re daydreaming about it as a kid, or when you make it to the NHL, you never really stop wondering what it would be like to win the Stanley Cup,” said Adams, who made his big-league debut in 2000–01 with the Hurricanes and has been an NHL regular in since the 2002–03 season. “You watch other players win it and you think about what the feeling would be like to do the same thing.” Winning the Stanley Cup has proven to be twice as nice for Adams. In 2006, the now 35-year-old skated in 25 playoff games as Carolina celebrated its’ first championship. Three years later, Adams appeared in 24 contests as Pittsburgh recorded their third Cup triumph. So, what would be better than winning two Cups? “That’s pretty easy, I suppose,” joked Adams, who has appeared in 78 post-season games. “You never forget that sense of elation when you hoist that trophy over your head. And you don’t forget what it took to get to that point. Perhaps the best part of it all is that you got to that moment as a group, with everyone working together, making sacrifices and doing those little things that make a difference.” While you won’t see him battling it out for the team lead in scoring, Adams, who has played the past three-plus campaigns with Pittsburgh, is the consummate team player, a guy known more for dishing out checks and diving in front of pucks, than piling up the points. Yet, last year, there was Adams, known for his stout forechecking ways, finding himself elevated for a time from his regular fourth-line duty to the third flight. The end result was 18 points, kudos from the coaching staff and high praise from his teammates. His secret for success? “I don’t think I did anything different, which is what usually helps me,” offered Adams. 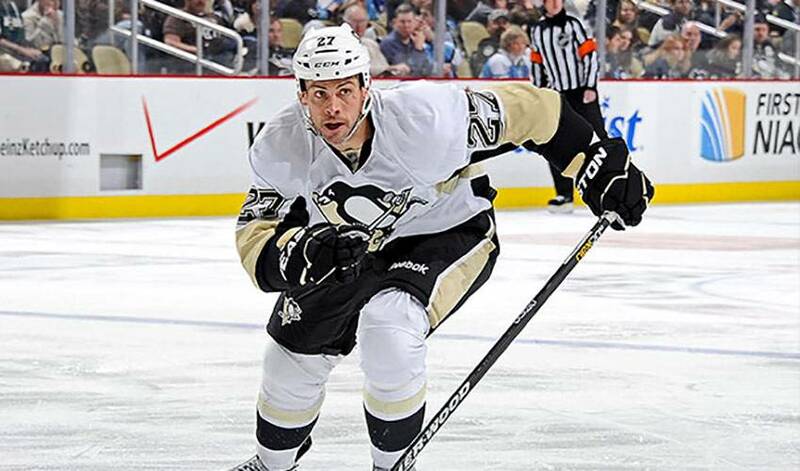 “Whatever situation you are put in, you find away to adapt and just do what you do best.” For Craig Adams, it would be contributing, in whatever way is needed, to Stanley Cup success.